Figure 1: Damping of electric field for the weak Landau damping case. 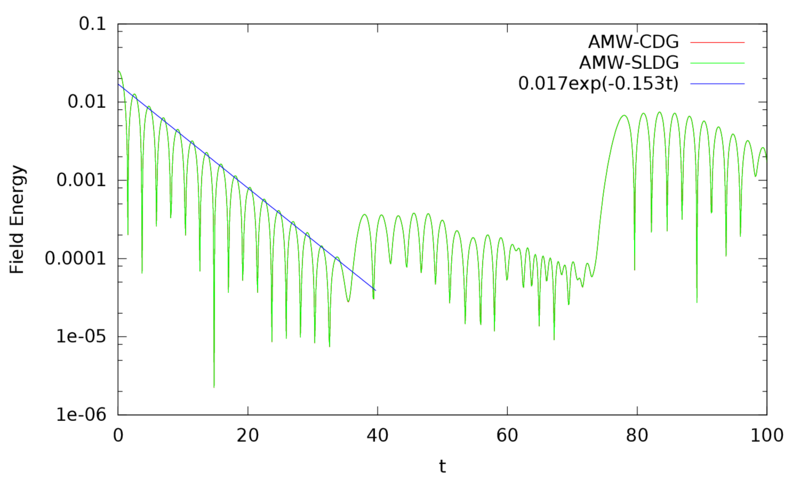 Figure 2: Mesh at t=80 plasma periods for bump on tail. 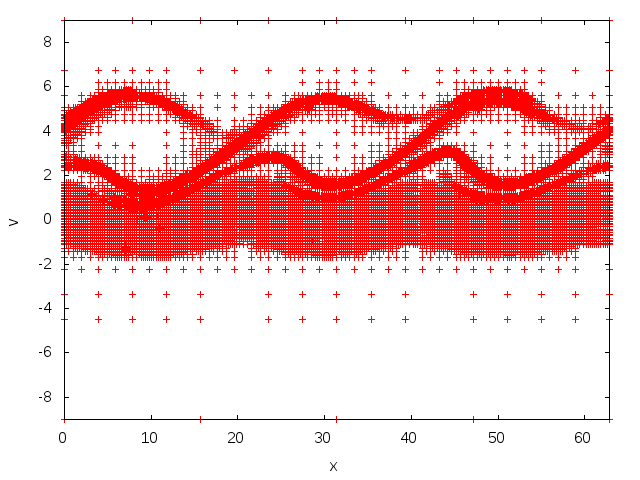 Figure 3: Distribution at t=80 plasma periods for bump on tail. The purpose of my PhD was to develop and compare different new numerical schemes involving adaptive mesh refinement for the resolution of the Vlasov-Poisson problem. Vlasov-Poisson equations are used both in plasma physic and in astrophysics. The main difference between the two contexts is the sign of the Poisson equation but this has no impact on the computation scheme. We implement Adaptive Mesh Refinement part (AMR) using multi-wavelet decomposition as in Alpert et al. (2002) and Alpert (1993). The method can be very easily coupled with a discontinuous Galerkin approach for the space discretisation since both parts use high-order local polynomial reconstruction. Time resolution is performed by combining the use of semi-Lagrangian time integration and Strang splitting technique (order 2). The first semi-Lagrangian scheme, that we call semi-Lagrangian discontinuous Galerkin (SLDG), was developed in Qui and Shu (2011). In this approach, we transform a time integration into a space integration along the characteristic curves. The second semi-Lagrangian scheme, that we call characteristic discontinuous Galerkin (CDG), was first proposed by Pironneau (1982) and Douglas & Russel (1982), renewed by Childs & Morton (1990) and recently by Guo et al. (2014). 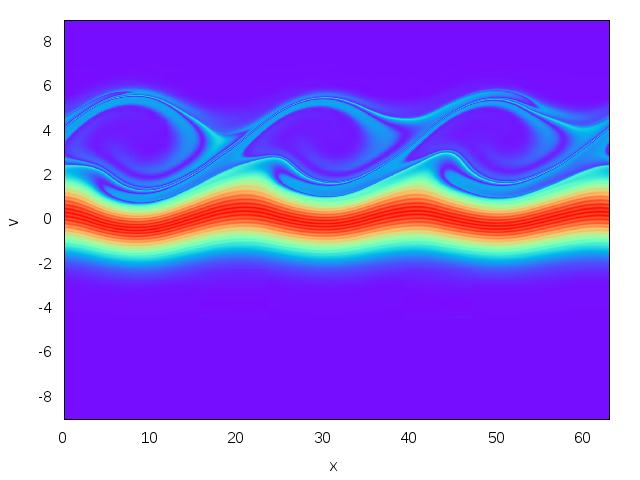 This approach computes the foot of the characteristics arriving at the boundaries of the cell at tn+1 to get the starting cell and applies the coefficients from this starting cell to the polynomials on the arrival cell. This simply corresponds to cell transportation. Adaptivity is performed in one dimension with algorithms from Alpert et al. (2002) and Alpert (1993) and is extended to higher number of dimensions through tensorial products. All these aspects have been tested on translation and rotation cases and show good conservation of numerical mass. I ran several test cases for 2D Vlasov-Poisson in plasma physics such as weak and strong Landau damping, two-stream instability and bump on tail, as well as test cases for astrophysics, such as a cold layer or Jeans instability. In all cases, we see good conservation of numerical mass. L1, L2 norms, extrema are not exactly conserved but their relative variation remains very small. However, such conservation violations are expected and consistent with other semi-Lagrangian schemes. The decrease of electric field for weak Landau damping is shown on Figure 1 and is in good agreement with analytical predictions. As one can see, SLDG and CDG give almost the same results (differences can be seen with very close attention paid to data files). Figures 2 and 3 respectively show mesh and distribution at t=80 plasma periods for bump on tail. These are obtained for polynomials of degree 2 (in 1D, so 9 variables per cell) with 8 levels of refinement (up to 256 cells per direction in full domain). The mesh follows very well the details of the solution. In order to take full advantage of adaptivity future developments include the resolution of the relativistic Vlasov-poisson problem presented by Arber, Dendy & Sircombe (2005), involving ions and electrons and on some relativistic Vlasov-Maxwell problems found in Besse et al. (2008). I also started the implementation of the four dimensional case.